This gift box has a length of about 7.5 in, a width of about 4 in, a height of about 2 in and a Net WT of 1 pound. 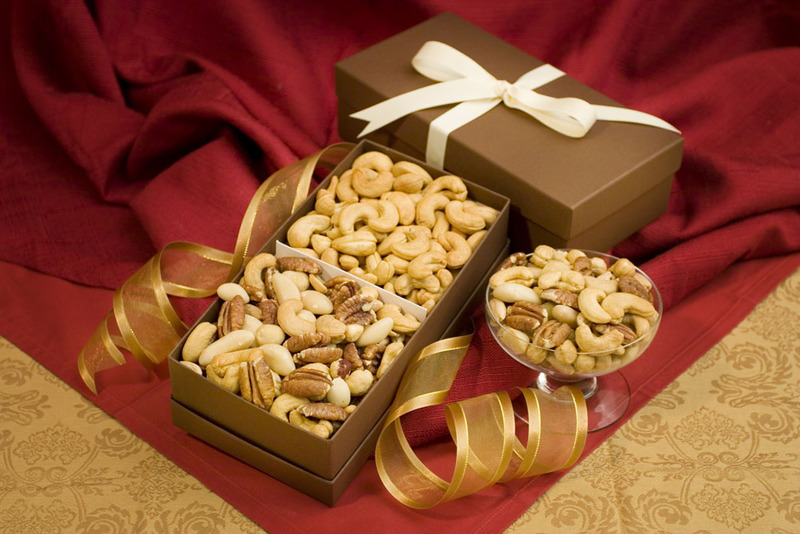 Our Gift Box Duo has a perfect assortment of our Giant Whole Cashews and Superior Mixed Nuts. Available Salted and Unsalted. Giant Whole Cashews & Superior Mixed Nuts Gift Box Duo - Net WT. 1 lb. 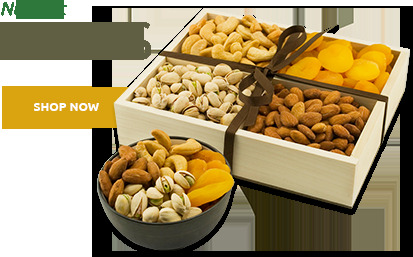 I HAVE HAD VERY GOOD SUCCESS WITH GIFTING YOUR NUT PRODUCTS TO MY CLIENTS. 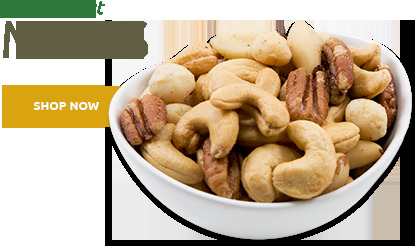 ProsTOP QUALITY NUTS AND FRUITS. DEPENDABLE SERVICE.. GOOD CUSTOMER RELATIONS. Sent as a gift. Heard it was good. Glad to be able to send unsalted. I purchased this gift for my grandfather for Father's Day and he absolutely loved it. The nuts were fresh and plentiful and beautifully packaged! One of the recipients said the cashew's were too oily to eat.. As i did not see them I can only say that everything else i've ever ordered from Nuts in bulk has been great..
On time and fresh!! highly recommend it! I sent the Cashew & Mixed Nuts Gift Box as a birthday gift to my son-in-law and he was very pleased. I absolutely loved this combination gift box. I love the salty and the crunch. I did not find the salt to be too much and I'm very careful of my salt intake. The mixed bag of nuts was my favorite and don't get me wrong, the cashews were great but the assortment of nuts in the mixed bag was pretty awesome. ProsThe combination of mixed nuts. The crunch. Not too salty. Everyone who received these from me mfor Christmas said they where fresh and really enjoyed them. Gentlemen - I have been very happy with the quality of your products. 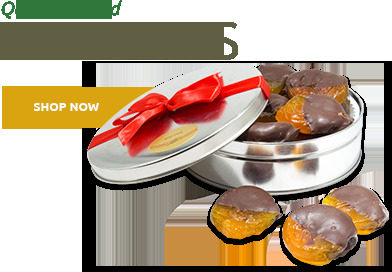 However, I used to buy my mother the chocolate dipped australian glazed apricots. 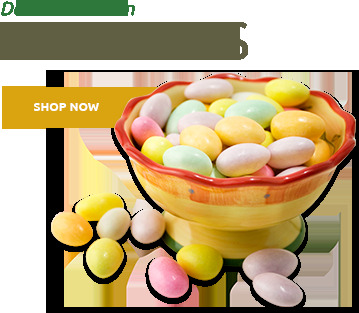 I had placed an order for them theis year, and cancelled it because when I am paying over $3.00 for an apricot and, in addition, I have to pay close to the total cost of the item to ship it, I'm not buying! I was originally promised a December 24 delivery of the gift, but it was not delivered until December 26. This is probably understandable, being Christmas and all. But please, Sup. Nut, don't state a promised delivery date that may not be able to make it to the destination on time. Also, rather than just "Yes" or "No" as recommendation possibilities, why not add a "Possibly" or "Maybe", which would be my choice of recommendation. ProsHaven't heard back yet from my sister who was the gift recipient. I'm sure she will say they were great. ConsDon't know yet-- just wish they could have been delivered on the 24th, not the 26th. 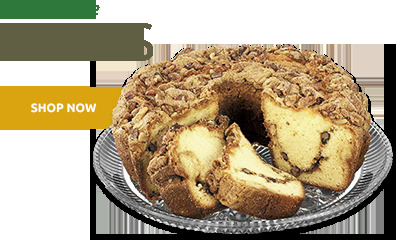 Will be ordering from Superior for the holidays from now on! It's a risk to purchase and send food gifts that you are not going to see or sample for yourself. Everyone we sent Superior Nuts to raved about how great they were, very fresh, and that they didn't last long in their homes. They were a hit everywhere! We thought this just the right size for people to use to serve over the holidays, and we sent them to our business associates as well. This was a gift to my fatehr. he told me that they were very, very good. However there was too much salt on the nuts. I told him that I will buy the ones with less salt next time. I got these as a gift for my father. He is a big fan of Superior nuts. He was pleased with the quality and size of the nuts. His only comment was that the mix was mostly cashews. He would have preferred a few more pecans and Brazil nuts. He said there were only 2 pecans in his box.